Just southeast of Bagan, at the base of Mount Popa is a solitary peak topped by golden stupas. The peak, known as the Popa Taung kalat shrine, is the favoured home of the infamous 37 Mahagiri Nats or animist spirit entities. Mount Popa is the spiritual headquarters to the 37 Nats and thus the most popular location in the country for Nat worship. It is now the official name of the famous Popa Taung kalat, with the nearby 1,518 metres above sea level extinct volcano renamed Taung Ma-gyi or Mother Mountain to distinguish it from the more famous Popa Taung kalat. Numerous legends are associated with Mount Popa including the story of its creation from a great earthquake when the mountain erupted out of the ground in 442 BCE. It is possible that the legends about Nats find their heritage from earlier animist religions in the Burmese countryside which tell of hundreds of animals being sacrificed here as part of worship rituals. The mountain is considered the abode of Myanmar’s most powerful Nats and is often referred to as Myanmar’s Mount Olympus. One legend tells of brother and sister Mahagiri Nats, from the kingdom of Tagaung, who sought refuge from King Thinligyaung of Bagan who granted their wish leading to them being enshrined on Mount Popa. Another tells of Popa Medaw, who was a flower eating ogress called Me Wunna. She fell in love with Byatta who was executed for disobeying the king who disapproved of the liaison and their sons taken away to the palace. Me Wunna died of a broken heart and, like Byatta, became a Nat. Although all 37 Nats of the official pantheon are represented at the shrine, only four of them – the Mahagiri Nats, Byatta, and Me Wunna – have their abode here. Mount Popa is a sheer-sided volcanic plug which rises 737 metres above sea level and houses a Buddhist monastery at the summit. To reach the top of Mount Popa, one must remove their shoes and climb the 777 steps to the summit. Along the way are a multitude of monkeys, many of whom expect treats and aren’t afraid to steal them from tourists! From the temple at the summit, you can enjoy sublime panoramic views. The ancient city of Bagan can be seen from one side, with the massive solitary conical peak of Taung Ma-gvi visible behind it to the north, while the views of the Myingyan Plain and beyond are wonderful. Popa means ‘flower’ in Sanskrit and it is possible to purchase bottled flowers that can be used as offerings at the temple. Superstition states that you shouldn’t wear red or black on the mountain, curse, say bad things about others, or bring any meat along, especially pork. These actions could offend the resident Nat who may retaliate with a spate of ill fortune and trouble, and this is the last thing anyone wants! A medieval town and the second most important archaeological site in the country after Bagan, Mrauk U is a gem of a find. The remote location, accessible only by a four to seven hour boat ride up a creek of the Kaladan River, means that you are likely to have the town all to yourself as less than 5,000 tourists visit the town every year. The town differs from Bagan in a number of ways, with smaller and younger temples predominantly made from stone and not brick dispersed throughout a still inhabited backdrop of busy villages and rice fields. A small settlement, Mrauk U was established as the capital of the last unified Arakanese Kingdom by King Saw Mon in 1433. The town expanded rapidly and eventually reached a population of 160,000 by the early 17th Century. 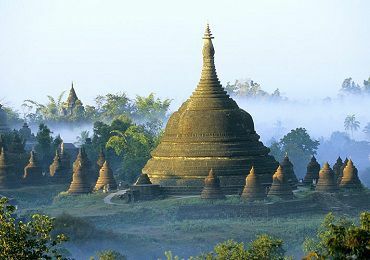 The town served as the capital of the Mrauk U kingdom and its 49 kings until the conquest of the kingdom by the Burmese Konbaung Dynasty in 1784. Due to its proximity to the Bay of Bengal, Mrauk U developed into an important regional trading hub and became a transit point for ivory, elephants, rice, and deer hide from Ava in Burma and of cotton, horses, spices, slaves, and textiles from Bengal, India, Persia, and Arabia. It was one of the most important ports alongside Pegu and Syriam in the country until the 18th Century. As well as being an important regional trading hub, Mrauk U was also a religious centre, with kings, ministers, and peasants constructing numerous pagodas and temples using the wealth they gained from trade to reflect their faith. Many of these religious structures still stand today and are second in number only to the thousands of religious structures in Bagan. The temples in Mrauk U are condensed into what is known as the ‘temple area’ with the most famous including Shite-thaung temple, Htukkanthein temple, Koe-thaung temple, Andaw-thein Ordination Hall, Le-myet-hna Temple, Ratana-pon, and the Five Maan Pagodas. To the southwest of the temple area is a pleasant local marketplace. Although Mrauk U is primarily a Buddhist site, there are several religious buildings of other faiths including the old Santikan Mosque and a Roman Catholic Church. Near the ruins of the Royal Palace, the Archaeological Museum has a wonderful collection of artefacts from Mrauk U sites including Buddhas, slabs with inscriptions, Wethali era coins, paintings of Mrauk U in its heyday, and a superb model of Mrauk U to help you get your bearings. Unfortunately, crumbling walls are all that remain of the Royal Palace itself. Another museum worth visiting is the L Amitie Art Gallery which contains numerous paintings of Chin Villages and other local sights. Day trips to the Chin Villages can be arranged at most of the hotels. Myanmar isn’t exactly known for its idyllic beaches in the same way as its neighbours in Southeast Asia, however, if the need strikes to take a day or two to relax, Ngapali’s palm lined beach is the perfect place to do so. Located seven kilometres from the town of Thandwe, it is the most famous beach in the country and among the most stunning beaches in the region. The beach stretches for three kilometres and overlooks the clear blue waters of the Indian Ocean. Although it has become a popular tourist destination in recent years, the area still manages to maintain a charming fishing village vibe, in line with what one would expect in Myanmar. The name Ngapali has no meaning in Burmese and is said to have been named by a wayward Italian who was reminiscing about his home city of Naples, Napoli in Italian. The area of Ngapali once had private bungalows, however, these were torn down by the government in the 1990s to make way for the development of hotels. The government continues to pile money into construction of tourist amenities in the area, promoting Ngapali as a major tourist destination in the country. However, many of the locals still live in small houses and go about their business during the day, evidenced by the small boats heading out day and night to catch a bounty of fish which is later served up wonderfully fresh in the hotels and restaurants. The small tourism industry and hotels provide income not only for Ngapali but also for the surrounding villages and Thandwe, ensuring that locals are benefiting from the construction and tourism invasion. The beach is simply ideal for beach lovers, offering peace and quiet, white sands, quiet rural surroundings, the Rakhine ways of life, and everything else that a beach lover would dream about. At the very south end of the beach is a giant golden Buddha atop a small hill. Walking to the top of the hill offers excellent panoramic views of the bay and the fishing boats below. The beach faces west, meaning that the morning doesn’t see much sun but the sunsets are spectacular from the white sands. Many resorts offer half day trips which include fishing, snorkelling, and a visit to a nearby island. A trip to the ancient town of Thandwe is a must, while day trips to various other nearby villages can be arranged without any fuss. For those wrho enjoy grass rather than sand, a golf course is situated close to the beach and is very wrell maintained. Peak season runs from November to March, however, even during the busiest times, Ngapali is a laid back, early to bed kind of place. A scenic hill town located 67 kilometres east of Mandalay, Pyin U Lwin (also known by the locals as Maymyo) was designated as a place to escape the Mandalay heat during British occupation. Although the name of the town changed from Maymyo to Pyin U Lwin upon the end of British rule in 1948, numerous colonial structures remain, ranging from impressive mansions which are now occupied by wealthy Chinese and Indians to churches. The town is also w7ell known for its fruit, vegetables, jam, and fruit wines as well as the massive military academies which train the Tatmadaw7 (Myanmar Army). The town began life as a military outpost established near a small Shan village with only two dozen households. In 1896, a permanent military post was established in the town and later, due to its cooler climate, it became a hill station and the summer capital of British Burma. The civic, commercial, and military establishment in Burma would move to Maymyo (as it was known then) to escape the heat and humidity of Rangoon. During Japanese occupation of the town between 1942 and 1945, the Anglo-Burmese population were incarcerated for fear of their loyalty to the British very close to Maymyo. However, today Pyin U Lwin maintains a strong Anglo-Burmese population, among the largest in the country. The British named the town Maymyo, literally meaning May’s Town in Burmese, after Colonel May, a veteran of the Indian Rebellion of 1857, however, the military government of Burma were quick to rename the town Pyin U Lwin after the end of the British rule. The town is strangely free of the ubiquitous pagodas, however, some colonial Tudor style houses remain standing and taking a stroll around the town is a great way to see how the Raj lived and to stumble upon the many churches. The National Kandawgyi Gardens is among the highlights in the town, established in 1915 as the Maymyo Botanical Gardens it features a rich and diverse collection of flora including a number of English varieties. A rose garden, an aviary, and orchid garden, and a stupa can all be found in the gardens. On the main intersection in Pyin U Lwin is Purcell Tower, whose clock is said to copy the chimes of Big Ben. Just behind the tower is Shiva Temple, while just south of the town is the Chinese Temple. Also just outside the town is the English Cemetery which although is in a poor state can be fascinating for any history’ buff. There are several natural wonders to explore using the town as your base including Anisakan Falls, Pwe Kauk Falls, and the caves of Pyeik Chin Miang which are full of Buddhas. Once the capital of Southern Myanmar, Bago is a highly trafficked town with a condensed number of attractions to explore. Located 80 kilometres from Yangon, the town makes an ideal and simple day trip or a great stop over destination when leaving the city. Many of the monuments found in Bago are centuries old, however, due to extensive renovation and restorations look much newer. The town is an excellent place to explore by bicycle and many of the attractions can be viewed in just a couple of hours. The Gulf of Martaban, on which Bago lies, was colonized by the Mon people from the Thaton Kingdom who established the town. The earliest mention of Bago comes from the Arab geographer, ibn Khordadbeh, around 850 CE. In 1056 the area came under rule of the Burmese, but after the collapse of Bagan to the Mongols in 1287, the Mon regained their independence. A Mon dynasty established itself at Bago, and when Queen Shin Sawbu chose a Buddhist monk, Dhammazedi, to succeed her in the late 15th Century, Bago became a centre of commerce and Theravada Buddhism. The area came under Burmese control again in 1539 when it was annexed by King Tabinshwehti of the Taungoo Dynasty and was made the royal capital from 1539 to 1599 and again from 1613 to 1635. The town was burned by the viceroy of Arakin during the Burmese-Siamese War in the late 16th and early 17th Centuries before being rebuilt by King Bodawpaya in the late 18th Century. However, it never regained its previous importance. One of the major sights in Bago is the Shwe mawdaw Pagoda, often referred to as the Golden God Temple, it stands at a height of just over 114 metres and holds the record for the tallest pagoda in Myanmar. The town is also home to one of the largest Buddha’s in Myanmar with a length of 55 metres and a height of 16 metres. The Buddha can be found at Shwethar lyaung Pagoda and is believed to have been built in 994. Kyaik Pun Pagoda is notable as the home to the Four Seated Buddha shrine, a 27 metre statue depicting Buddha seated in four positions. Kanbawzathadi Palace was originally built for King Bayinnaung in 1556 and consisted of 76 apartments and halls. The original palace was burnt down in 1599, however, reconstruction was completed in 1992 and offers an air of authenticity. Other sights in the town include Maha Kalyani Sima, Mahazedi Pagoda, Shwegugale Pagoda, and Snake Pagoda. Located at the end of one of the most densely farmed areas in Myanmar, Pindaya is a small town in the Shan State of the country. The main reason one would travel to Pindaya is to visit the famous Pindaya Caves, a series of limestone caves where thousands of images of Buddha have been consecrated and worshipped for hundreds of years. The caves are located next to the town, which itself is known for hosting an itinerant market every fifth day. According to legend, the term ‘Pindaya’ is a modern corruption of the word Tinguya’ which translates as ‘Taken the spider’ in Burmese. The name came from a legend that tells of a large spider that once resided in the caves and captured a local princess. The princess was eventually rescued when the spider was slain by a prince using a bow and arrow. When the prince killed the spider he is said to have exclaimed that he had ‘Taken the spider’, that is to kill it. Thus, the prince’s exclamation became the name of the region and the caves where the spider once resided. Sculptures of the spider and the prince aiming his bow and arrow have been added in recent times at the entrance of the covered stairway of the caves. Another legend tells of a secret tunnel through the caves which leads to the city of Bagan. When visiting the cave, you can see where a path is mysteriously blocked off and it is said that this tunnel leads to Bagan. Beyond the market which appears in Pindaya every fifth day, the town doesn’t have much to see and is really only a base for exploring the caves. At the entrance to the southernmost cave there is a 15 metre pagoda named Shwe U Min (Golden Cave) which according to legend was built by King Asoka and repaired by King Alaungsithu in the 12th Century. The modern day entrance to the cave dates from 1925 when it was enlarged by explosives and features dedication inscriptions from Hindu, Chinese, and even Muslim communities as well as the Theravada community. The interior of the southernmost cave extends for approximately 150 metres and contains over 8,000 images of Buddha. The earliest images and statues with inscriptions date from the 18th Century, however, there may be ones without inscriptions that are even older. The full collection offers a superb glimpse at Buddha iconography and art from the early Konbaung era to the modern period along with unique images of the Bhisakkaguru tradition dating to the late 18th Century. These Bhisakkaguru images differ from most other images from Burma in terms of hair, eyes, nose, robe, etc., and are from the Mahayana tradition leading to the conclusion that the cave may have at one time served the Mahayana Bhisakkaguru cult. Located on the eastern bank of the River Chindwin, northwest of Mandalay, Monywa is an engaging trade town that offers the perfect base for exploring the series of interesting attractions in the surrounding countryside. The town itself offers bustling markets, two enormous pagoda complexes, and a wonderful riverside setting to while away the evenings, although general visitor facilities are limited and it is worth planning accommodation in advance. It also acts as the embarkation point for those who wish to boat hop the Chindwin to the permit-free town of the north. The name ‘Monywa’ comes from ‘Mon’ meaning ‘cake or snack food’ and ‘Ywa’ which is Burmese for ‘village’. Legend has it that a Burmese king fell in love with a seller of cakes from this town and made her his queen, with some saying the original name of the city’ is Mon-thema-ywa or ‘Village of the woman cake seller’. There has been a settlement here since the Bagan period, with the chronicles mentioning Monywa as one of the places King Alaungphayar encamped for the night on his campaign to Manipur in 1758. Monywa remained a small village until a year after the Annexation of 1886 when it became the Headquarters of the Lower Chindwin District. This, in conjunction with the legalising of border trade with India, has led to Monywa growing into a prosperous and bustling trade city. The surrounding area of Monywa is dotted with small farms and villages mainly involved in agriculture, growing crops such as beans, palm sugar, and cotton, which are then brought into Monywa and sold at the markets. A large copper mine to the west of the Chindwin River has also contributed to the trade culture in Monywa. The main tourist attraction in Monywa is Thanboddhay Pagoda, a Buddhist temple which dates from 1303, although it was reconstructed in 1939. Similar in architectural design to Indonesia’s Borobudur, the pagoda is said to contain over 500,000 images of Buddha with a pair of magnificent white elephants guarding the entrance. Nearby, at Bodhi Tataung stands two giant statues of Buddha and a golden pagoda. One of the Buddha statues is standing while the other is hang down on its side and guests can enter the standing Buddha to explore images on the walls. Near the reclining Buddha is the Aung Sakkva Pagoda which reaches a height of 13.6 metres and is a landmark for the area. The Aung Sakkva Pagoda is surrounded by over 1,000 smaller satellite pagodas that shelter over a thousand sacred images of Buddha. Another major attraction is the Phonwintaung cave complex across the Chindwin River which houses numerous statues and images of Buddha, many dating from the 17th and 18th Centuries. In the surrounding area of Monywa, one can find the Ledi Kyaung Monastery and Twin Taung Hill, an extinct volcano whose crater now form a wonderful lake.